* Mariell's shimmering wholesale Cubic Zirconia Bridal Bracelet features dainty clusters of marquis-shaped CZ's in a unique 6 1/2" Petite length. * Our new delicate size wedding bracelet is 3/4" wide at the center and is plated in Genuine Silver Rhodium. 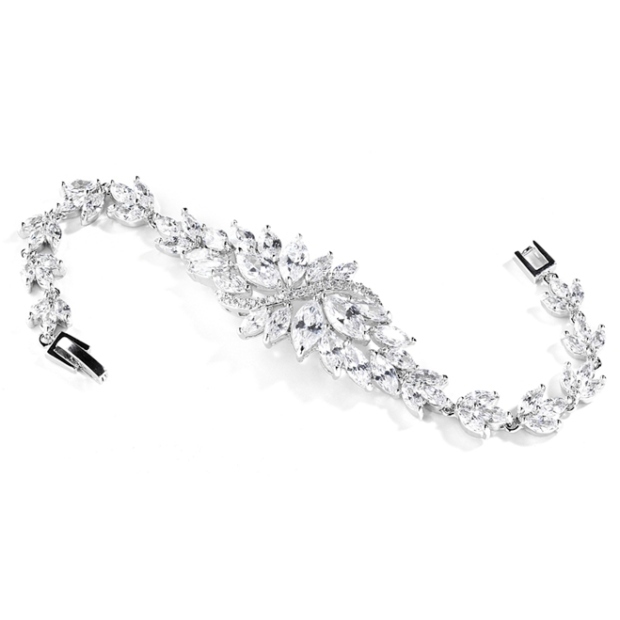 * Our sparkling Cubic Zirconia Bridal Bracelet features dainty clusters of marquis-shaped CZ's. * After receiving many customer requests for bracelets to fit a smaller wrist, Mariell has created this unique petite-sized wholesale bracelet in a new 6 1/2" length for brides, bridesmaids and prom girls. * These gorgeous Genuine Silver Rhodium bracelets are also available in the standard 7 1/2" length as style 4014B-S-7. * Both lengths are also stocked in warm Gold tone. * We offer matching earrings sold separately as style 4014E-S.
* This smaller sized bracelets are a must have for your wedding jewelry display to accommodate and please all your customers!